When London Life, Lagos Living came out last November there was a lot of buzz about it in Lagos. It's a coffee-table book, with a twist. 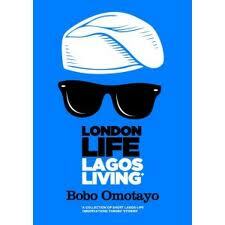 It contains 37 short stories about Bobo Omotayo's experiences living in Lagos. If you ever wanted to know how a Lagosian lives, or let be more specific if you want to know about 'Naija' life then London Life, Lagos Living will definitely give you a glimpse into that. Obviously the book is told from Bobo Omotayo's perspective, but this is a life where one teams his wayfarers with his fila (I think that's what the hat in the front cover image is called but not being Yoruba I might be wrong), where image is most likely everything, and where the weekend isn't complete without drinking some Veuve Clicquot at a wedding. It's no secret, I judge a book by its cover, but for this one I definitely preferred the design of the book (both inside and outside) to its content. This book is beautifully made. The quality of paper used, the design of the book, the images (both photos and pop-art) are all amazing. This is an absolutely gorgeous book. When it came to the short stories, I was kind of so-so with them. Also, on some level I did like his conversation-style writing, as it felt more like I was in a friends living room listening to him tell a story about his day, or his weekend, or something that he saw on his way to work, but after a while it became a bit too much for me. If you are into colloquialism and conversation-style writing, then I would definitely recommend. It's also a really quick read. I read it in a couple of hours. Sorry to hear these aren't better, I may wait on trying to find it myself.